Does anyone know what the max allowed DD is? I know its probably doesnt even matter since this guy doesnt respect any rules but did he ever set an equity stop or something similar? See behavior over 26 months of track record. See behavior over 26 months of track record. See how DD related to periods of Profit / Gain. Currently open DD stands at 15% and booked profit over last 5 weeks stands at 18.75%. these are low risk stats and remember this is a relatively "bad" time for this strategy. Every "rule" and guideline must be viewed in the light of the market at each important moment when it arises. This means that unfortunately DD might surpass the long-term average between 10 and 26% but over the long run it will not AND ..... this is the rest of the story that makes my strategies profitable and have edge..... the Gain is more than the PAIN..... if you endure the periods of DD. Myfxbook is useless when it comes to DD. Darwinex is showing a 67% DD which is much more in line with what I am seeing from your trading. 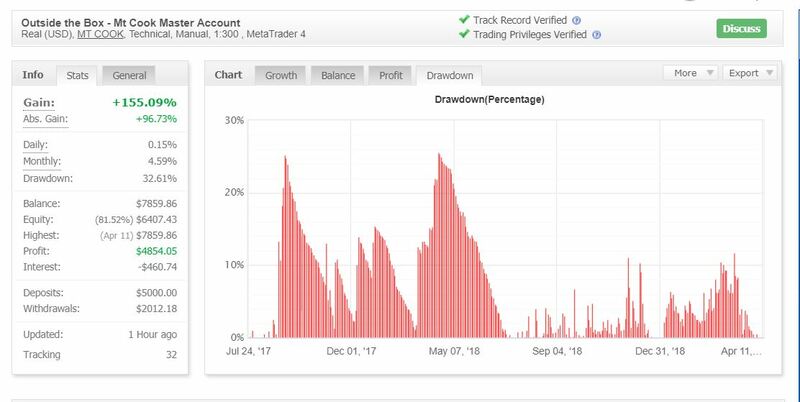 Your myfxbook account connected to Darwinex mt4 shows 50% DD. Why did you use myfxbook DD and not Darwinex? And are you planning to keep the trades open until they kill the account if they keep going against you? I am asking because you never respect anything you say and you keep breaking your word all the time and it will cost subscribers a lot of money at some point. his account blown up by this trader, does truly deserve it! And UP the dow goes, longing it now! However for those that are still following - please be careful and think twice before following this signal. It doesnt matter what you say, OTBHK will always have something to say about how great his trading is and basically that its your own fault if you loose money following his signal. Of course thats what anyone would say to protect the revenue they earn from naive followers! Any trader that allows a signal account to blow up - regardless of the risk specified - is completely irresponsible and not worth following at any risk! It's really a matter of STAYING INVESTED for at least 12 months, like real fund investors normally do. It's really a matter of learning when to ADD to your investments in systems that are profitable over more than 2 to 3 years. It's really a matter of calculating GAIN (overall) to PAIN (average max drawdown over 1 year) and how much profit a system / strategy has generated if the investor follows the system as advised by the manager and only adds to investment. I hear all that is being said, but I am the captain of this ship, and I have been here many times before. Recovery happens relatively quickly and the losers have always (up to this point) have been those who allow their fear / emotion to cause them to cut investments during a significant drawdown and then to not re-invest. Exactly what happened to my brother in Nov 2008 ---- ouch -- now the S&P 500 is 3x higher -- 10 years later. I agree - long term outlook and profit withdrawals work best with this system. I check it every other week or so. My beginning numbers are somewhat worse than they could have been due to some messed up risk management on my part and also some unfortunate manual trades. Do you know why otb mfxbook account is not updating from 21 hours? Its quite possible hes away and hasnt got his MT4 open to provide update to myfxbook. but rest assured he has his eyes on the account as well as the trades.